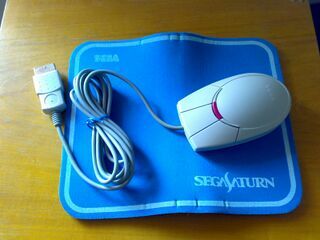 The Shuttle Mouse (シャトルマウス) is an official mouse peripheral for the Sega Saturn. It is a successor of sorts to the Sega Mouse, released for the Sega Mega Drive some years prior, and was designed to be used with simluation-orientated games where a standard control pad is hindered by the style of gameplay. It later became an accessory to assist in the Saturn's primitive online capabilities, alongside the Saturn Keyboard. The Shuttle Mouse is a four-button ( , , and ) ball mouse which shipped with its own light blue mouse mat in two different colours - a grey model with a blue button (HSS-0102) to match early Japanese Saturns, and a white model with a red button (HSS-0139) to match later ones. The latter was also bundled with limited editions of Sakura Taisen but colour schemes aside, all Shuttle Mice behave identically. As with many mice of the day, the Shuttle Mouse pre-dates many modern computer mice "standards" and thus can be cumbersome to use - there is no scroll wheel, and as it uses a ball, its inner workings are susceptible to being clogged up with dust and dirt, causing the device to not function as intended. Unlike the Sega Mouse, the Shuttle Mouse was only officially released in Japan. In North America, consumers were given a different mouse - the NetLink Mouse, which provides similar features. A European release for the Shuttle Mouse was once planned for late 1995 but shelved for unknown reasons - magazine coverage suggests the model would be black, to match with European Saturns. Main article: Shuttle Mouse/Magazine articles.